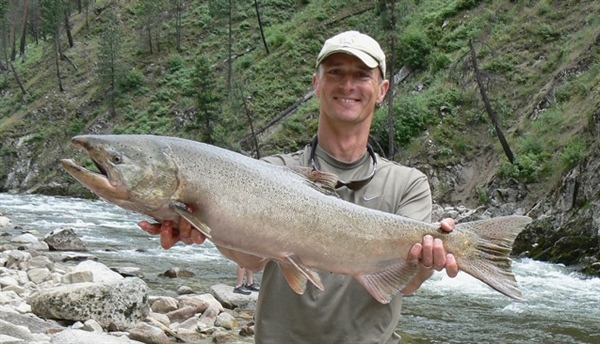 We just received a message from Greg Schoby with Idaho Fish & Game–yahoo! I’m happy to announce that this a.m. the IDFG Commission approved the proposed Chinook season on the Upper Salmon River from the posted boundary at the Colston Corner boat ramp (~6.5 miles downstream of Ellis, ID), upstream to the posted boundary approximately 50 yards above the mouth of the Pahsimeroi River at Ellis. Daily = Four (4) Chinook Salmon, only two (2) of which may be adults. Possession = Twelve (12) Chinook Salmon, only six (6) of which may be adults. A full press release as well as rules will be posted on the IDFG website soon. Currently, we are anticipating a harvest share of ~300 fish for this section of the fishery. Thanks everyone and good luck out there!